The idea of starting the construction of a space elevator from geostationary orbit, as proposed in I960 by Yuri Artsutanov, is still the baseline for current space elevator plans. However, important improvements have recently been proposed by Bradley Edwards, a pioneer in the field of space elevator engineering. Working on NASA grants (a total of $570,000 by 2003) and leading a research staff of 70 people at the Institute for Scientific Research (ISR) in West Virginia, he has developed a more refined strategy. In his plan, construction begins with the launch of a satellite carrying a spool of ribbon tether, paper-thin and tapered from about a third of a meter (one foot) wide at GEO to some 14 cm (5 inches) at Earth's surface. This tether would have to be made of a revolutionary, extremely strong, and not-yet-existing material. The ribbon will likely be based on strings of carbon nanotubes held together by an epoxy matrix. The use of anything else would result in an extremely heavy and thick cable, requiring thousands of rocket launches to put up. Edwards is confident that the ongoing development of nanotube materials will eventually result in the tensile strength, with a safety factor of two, of 130 gigapascals that he needs for his design; 130 gigapascals translates to a load of 1,300,000 kilogram per square centimeter (18,500,000 pounds per square inch). Using a cable with such an incredible tensile strength, it would be possible to vertically suspend the entire, fully loaded, 83,000 metric ton (183,000,000 pounds) aircraft carrier U.S.S. John F. Kennedy on a cable with a diameter of just under 10 cm (4 inches)! In comparison, the tensile strength of steel is only 42,000 kilogram per square centimeter (93,000 pound per square inch), or just over 3 percent of what would be needed for a space elevator (for more on this topic, see Cable Material in Chapter 7). The tether deployer satellite will be rather large and heavy; in Edwards's estimation over 80 metric tons (175,000 pounds) in mass, including propellant to move it from a low Earth orbit to GEO. A Space Shuttle can put about 24 metric tons (53,000 pounds) in a low orbit, so at least the equivalent of four shuttle launches and some in-orbit assembly would be required to put a complete deployer in space. More flights are probably required if the volume restrictions are taken into account. On the other hand, the new Ares V launcher NASA hopes to have operational by 2020 should be able to lift 125 metric tons (275,000 pounds) into a low Earth orbit. A single launch of this huge rocket may thus suffice. Once assembled in space and thrust into geostationary orbit, Edwards's satellite would start unwinding a single tether ribbon. Some velocity will have to be imparted to it to start the deployment, but once a couple of kilometers are out, gravity-gradient forces will pull the rest of the tether away. In reaction to the lowering of the cable and according to the principle of momentum exchange, the satellite with the spool will go upward. 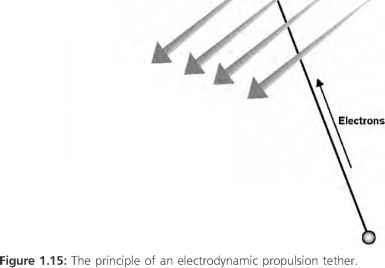 This automatically ensures that the system's center of mass remains at the right, GEO, altitude (or seen in another way, the satellite goes up because conservation of momentum will ensure that the total system's center of mass will remain at the same altitude). As long as it keeps on deploying tether, the satellite will continue to move further up to higher altitudes. Figure 6.2: Deployment of an initial space elevator cable according to the plan of Bradley Edwards. deployer satellite is allowed to drift upward to later act as the initial countermass. In comparison to the dual-cable deployment of Artsutanov, this single-cable concept should significantly simplify space elevator construction. 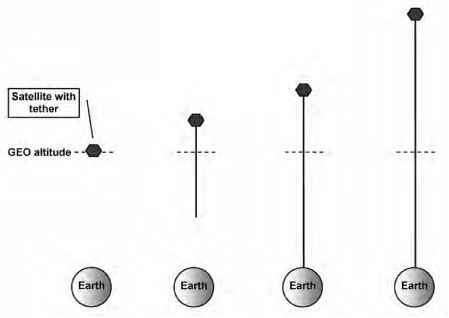 When the tether in Edwards's concept eventually reaches the surface at the equator, it is tied to Earth and the first space elevator link is complete. The satellite will however keep on deploying tether, drifting further outward until it reaches an altitude of some 100,000 kilometers (62,000 miles), over a fourth of the distance to the moon. There it will stay to act as the required countermass, keeping the cable taut (Fig. 6.2). The single cable will still be relatively weak and vulnerable, but sufficiently strong to carry the first mechanical climber/lifter. This machine is sent up from Earth and, while ascending, deploys and attaches a second tether alongside the first one. A second, maybe even heavier climber carrying a thicker ribbon can now be sent up to deploy and attach a third parallel cable string. This process is repeated over 200 times until a sufficiently strong space elevator is formed, allowing heavy cargo climbers to ascend into space. The completed cable will be tapered, with its largest cross section at GEO, where tension in the space elevator will be highest. At the Earth's surface, the pull on the tether will be rather small—just enough to prevent the whole system from coming down due to the mass of a climber starting its ascent. The increasing mass of the growing cable reaching down to Earth has to be compensated for, to prevent the space elevator from being pulled down. A solution could be lengthening the cable above the GEO point, which increases the rotational velocity of the end mass and thus results in a stronger centrifugal force on the cable (the end mass will travel a wider circle while still making one round in 24 hours, which means it will have a higher speed). However, it would be more practical to add mass to the original deployment satellite acting as countermass at the top of the tether. That could be done by parking the cable deploying climbers there after they have done their job, as Edwards suggests. In his cost estimates, the effective cost of the delays in upgoing transportation due to the time required to bring climbers back down on the same single cable is higher than the cost for new climbers. If the economic balance turns out to be different, it may be more efficient and less expensive to transport cheap material like stones or sand from Earth to the end point with reusable cargo climbers. In science-fiction stories and even technical descriptions of space elevators, the countermass is frequently provided by an asteroid, which is often also mined to supply the raw materials needed for the construction of the cables. However, capturing a Sun-orbiting asteroid and using it in Earth orbit as the starting point for a space elevator is way beyond our current technical capabilities. It would involve somehow landing powerful propulsion systems on an asteroid and using them to change its orbit. A series of carefully choreographed planetary flybys would probably also be needed to sufficiently modify the asteroid's trajectory and put it in orbit around Earth. The employed method would need to have a very high level of accuracy, to avoid an asteroid impact catastrophe (such as the dinosaurs experienced). Capturing asteroids to build space elevators means making one revolutionary technical development (the elevator) dependent on yet another one (capturing asteroids), which is generally not solid engineering practice. A space elevator able to handle 20-metric-ton (44,000-pound) climbers, taking into account Edwards's assumptions on the revolutionary tether material, would have a total mass of 1600 metric tons (3,500,000 pounds)— 1000 metric tons (2,200,000 pounds) of tether and another 600 metric tons (1,300,000 pounds) of counterweight. This does not appear to be a ridiculous amount of material to put in orbit, as the International Space Station has a mass of about 500 metric tons (1,100,000 pounds). A completed space elevator could be used to build more of them, because the easy access to space it provides would simplify sending up new space elevator deployer satellites. The amount of time and money required to construct them would drop for each subsequent elevator, eventually resulting in large-scale, regular and affordable transportation to space. In fact, the construction of a second space elevator is likely to be the first thing the initial system will be used for, to avoid having to start all over again if the original space elevator is destroyed for whatever reason. Instead of using climbers to add lines to the initial cable, alternative ideas have been developed involving the lifting of additional tethers using a reel mechanism on the GEO satellite. Similar to the climber concept, a potential problem with this approach is that it would pull itself out of orbit if the mass of the uploaded tether is too high with respect to the centrifugal force provided by the countermass. A solution could be to first pull up a very thin, lightweight tether and then use that to haul up additional countermass material. The cable could subsequently be pulled back down to Earth to lift up more countermass and additional parallel tethers to reinforce the space elevator. An issue with this scheme is that if the reeling mechanism on the satellite fails, the whole space elevator construction process breaks down. Climbers instead are easily replaceable. On the other hand, a benefit is that instead of hundreds of climbers, potentially only a single satellite reel mechanism is required. An important decision in the development of any space elevator is where to connect it to Earth—that is, the location of the anchoring point. As we have seen in Chapter 1, this point has to be located on the equator. A location on land in South America or Africa seems to be a logical choice. However, using a mobile oceangoing platform has many advantages over a fixed location. One is that it makes it possible to move the cable out of the way of major storms and even orbital hazards. Another is that most of the equator runs through the ocean, so that a floating anchoring point offers a much wider range of possible locations than a land-based connection. It enables the lower end of a space elevator to be put in an area with a maximum of fair weather, a minimum risk of lightning strikes and severe storms, and well away from aircraft routes. The equatorial region of the Pacific Ocean appears to be attractive in this respect. 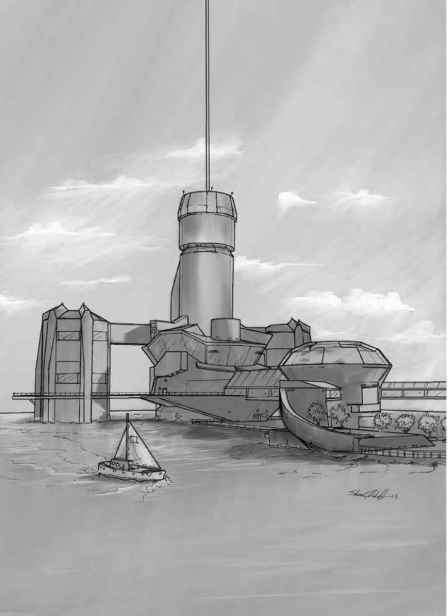 Remote locations on the ocean are also easier to protect against unwanted visitors such as terrorists seeking to cut a space elevator cable, although setting up a defended no-go zone around the platform in international waters will require new international treaties (Fig. 6.3). A floating anchoring point has its disadvantages as well. One obvious problem is that it will move due to currents and waves. A system compensating for this motion by reeling cable in and out and thus avoiding too high tension will be necessary. Another issue may be the exposure to salt water, which is very corrosive and could damage sensitive space elevator equipment such as climbers and reels if not sufficiently protected.